" Malcolm Foster has worked for several years with The Pretenders and recorded "Learning To Crawl" (1984) with them. " 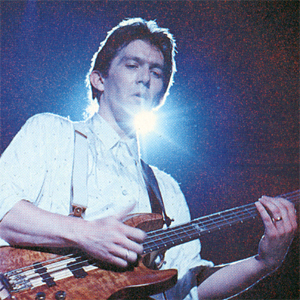 Malcolm Foster left The Pretenders to pick up bass with Simple Minds for the Street Fighting Years Tour after the departure of John Giblin. He recorded Real Life and Good News From The Next World with the band and went on the road with the associated tours. He's since emigrated to New Zealand and occasionally plugs-in on stage when Simple Minds are playing in his neck of the woods.